Many people are familiar with hydroponics, the method of growing plants in mediums other than soil, often under artificial light. A well-balanced hydroponic system can produce large amounts of produce, and not surprisingly, many amateur pot farmers are dedicated hydroponic enthusiasts! Aquaponics adds another element to these systems, live fish, so not only are you growing produce with their important nutrients and micro-nutrients, but you’re growing fish as well for a continual source of protein. Fish serve a vital purpose in the aquaponic system because their poop serves as a fertilizer for the plants as the water is pumped from the fish tank and then filtered by the plants in their grow bed. The plants take their turn in this synergistic system by cleaning the water that is then returned to the fish tank. It’s 100% win-win for the fish, the plants, and the lucky people who harvest and enjoy the produce. Just think. You could sit down to a delicious meal of tilapia, flavored with herbs and accompanied by steamed veggies and a fresh salad, all grown in your aquaponic system! You’re in complete control when it comes to selecting the types of produce and fish that are grown. If you’ve been worried about serving your family GMO crops or have been concerned about pesticides and other chemicals used on America’s large commercial farms, an aquaponic system will bring peace of mind. Is an aquaponic system something you could set up in your home or backyard? Definitely! Aquaponic systems range from small tabletop systems to those that utilize a backyard swimming pool! The backyard swimming pool system may look impressive, but it isn’t the most efficient use of water, space, and resources, not to mention the expense of building the pool in the first place and the cost of running the large pool motor 24/7 and replacing large amounts of water lost to evaporation. Putting together a smaller system, then, is the far more practical approach for most people. I’ve seen many DIY systems online and in YouTube videos, but when Chad Hudspeth of Endless Food Systems invited me to take a look at his designs, I was impressed. His systems are simple to put together and designed for maximum efficiency. In a worst case scenario, water and energy will both become luxuries. Chad told me that an Endless Food System uses about 90% less water than a conventional garden and in a grid-down scenario, the system could be operated by a solar panel system. Another selling point for me was the raised beds to make planting and harvesting easier on my back and the fact that I’ll never have to pull weeds again! In fact, once set up, an aquaponic system requires very little maintenance on a daily basis. The overall concept is very simple, but putting all the pieces together so the right balance is achieved and maintained between water, fish, and plants does take a bit of doing. 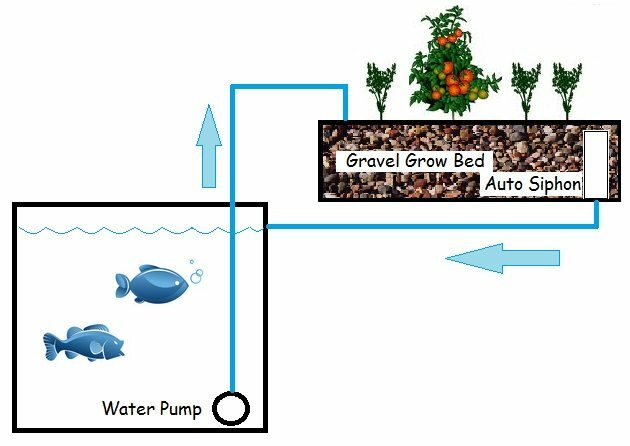 “Aquaponics is a simple theory: the water from the fish tank is pumped into a grow bed where it is filtered and used by the plants. In reality to jump out there and build a system can be challenging. I am a pretty mechanical person and have a history of building all kinds of devices. 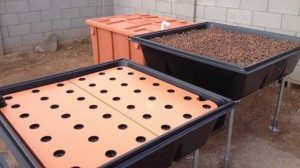 In addition, I love to research and so when I decided to create and mass produce aquaponic kits, I really thought it was going to be a piece of cake. As I began to go deeper into it and figure out the true parameters it became much more complex. In spite of all this experimentation, Chad told me that not a single fish has died under his care, other than those on his dinner plate! “There are a lot of “tote” systems out there. Totes are cheap and available but very ugly and hard to work with. I wanted to offer a very easy snap together system that would look attractive. However, if you’re ready to tackle this project on your own, Endless Food Systems offers an ebook with detailed instructions for building your own system. They are happy to provide not only the plan designs, videos, and all they have learned from working with aquaponics, including an online forum for their DIY customers. To my knowledge, this is unique in the world of hydroponics and aquaponics. This option will be most viable for the person who is not only handy but lives in an area where the supplies are easily available. Does a more expensive system pay for itself? Whether you select an energy efficient system from Endless Food Systems, use their plans to make your own, or venture into aquaponics on your own, the materials to build the system, fish, plants, and other supplies will range anywhere from a couple hundred dollars to a few thousand. Keep in mind that the system is a one-time purchase unless you decide to expand it in the future. Whether or not you stick with it long enough! Let’s face it. A lot of us jump into one hobby or another and it eventually becomes a money pit. An aquaponic system will eventually save you money, but not if you lose interest. At least keep it running for the sake of the fish! How you currently eat. If you normally purchase more expensive organic produce or expensive cuts of meat, then you’ll see a return on your investment more quickly. If you are already pinching grocery pennies, then it will take longer. Whether or not you actually eat, or at least preserve, what you grow. We’ve all seen the slimy remains of formerly fresh produce in our refrigerator bins. If you allow your homegrown produce to suffer the same fate, then you’ll be losing money, not saving it. Be sure to grow produce you and your family will eat! Will you be preserving the extra produce? If so, you can plan on extending your savings far into the future. Might you be able to sell your extra produce? Once your aquaponic system begins to really produce, you may very well be able to set up a table at a farmer’s market, making your system a producer of food and revenue! Q: I don’t have much space in my home. Will that be a problem? A: An aquaponic system can be as small as a couple of large pots hooked together with a small pump. A set up like this would be great for growing a selection of herbs indoors and having a few fish for an occasional meal. It will only need the proper type of lighting to thrive. Q: My kids don’t care for tilapia. What are my other choices? A: Tilapia do very well in hot climates in the southern part of the country. Depending on where you live, you may want to grow catfish, crappie,or large mouth bass. If you truly don’t like fish but still like the idea of aquaponics, you can grow goldfish, koi, or other ornamental fish. Q: I’ve heard these systems can produce huge amounts of food each year. Is that true? Based on his own research and personal experience and for comparison purposes, this is what the Endless Food Systems are capable of producing. 1. The Genesis 12 system can grow produce and fish as a supplement to one’s diet but is not large enough to fully feed someone. 2. The Genesis 36 can perpetually feed one person or provide supplemental food for a family. This particular system is expandable and has 32 square feet of grow space. 3. The Sanctuary series can produce enough food to completely feed 3-4 people perpetually with its 128 square feet of grow space. An interesting note about this numbered system is that it represents not only the number of square feet in the system but when multiplied by 10, the number of pounds of produce the system is capable of producing in a year. For example, the Habitat 32 system has 32 square feet of grow space and can grow up to 320 pounds of veggies per year. A 300 gallon fish tank is capable of producing up to 100 pounds of fish per year. These ballpark figures should help you calculate what you and your family or group might need. Q: I’ve seen these systems online and it seems that all I need are some plastic containers, a pump, and some PVC pipe. Why are the Endless Food Systems so expensive? A: A quote that I’ve come to trust and appreciate is, “The bitterness of poor quality remains long after the sweetness of low price is forgotten.” A few plastic pieces may not cost much, but will they produce a non-stop food supply and how much trial and error will go into finally getting it right? The concept of aquaponics is simple, but quickly establishing a food producing system, not so much. One thing you might consider is joining with another family in the purchase of one of the larger systems. Since all but the Concept 10 is expandable, the original purchase could be divided, but two families could reap the benefits of this high quality system. 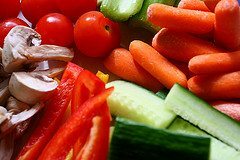 The average family of 4 spends around $500-600 per month on groceries. This amount doesn’t include meals eaten in restaurants. That comes to well over $6000 per year, and it’s easy to see how an aquaponic system might pay off in a fairly short amount of time. This post is sponsored by Endless Food Systems. I visited their company and saw, first hand, their dedication to designing a high-quality aquaponic system and bringing these life-sustaining systems to homes around the country. I want to point out that these systems aren’t magic — there are two things you need to add. One is effort, because there is some work involved. But the other is food for the fish! High-protein catfish chow etc. is probably what they’ll recommend. You’ll still need to provide food for the fish, or the entire system falls down. So be careful depending on this as a ‘survival’ tool. A system like this would be most beneficial to those with access to very little land to grow on. It would also be good for people who do not want to “get their hands dirty” so to say with the soil! 🙂 Another great thing about aquaponics is that the plants generally grow much quicker compared to soil based gardening and the food is organic (chemicals & fish don’t mix too well)! I know from owning large aquariums that water pumps can use a fair amount of electricity, something I try to use as little of as possible. In a grid down situation, in the absence of solar or wind power, is there an alternative way to devise a syatem like this without the use of a water pump? Chad’s the expert, but I’ve read it is possible to develop a system with no pump. For example, I’ve heard in third world countries where there is no or very limited electricity people use some “creativity” to “get the job done”! Maybe when Chad’s not so busy with the DIY product launch he’ll do a video or something on it. It would be a great topic for our DIY member’s area! As far as the electricity usage, our pump & aerator only use about 25 watts. A lot of the water movement in our systems is done via gravity! The big question I have are these very practical to have year round in the outdoors in the majority of the US? Or are a most of the users going to need to be putting them inside their homes? I know that using gas, electricity, or propane to heat even a small green house can be very costly. Just wondering what the expectations would need to be, especially for keeping the fish alive. They are practical but a greenhouse is recommend (and for sure needed in certain locations) if it gets too hot or too cold where you live. Indoors is certainly an option with grow lights. One product we offer that can be used to heat the water for free (after purchase) and is a low tech option is our Thermo siphon Solar Collector (regular sunlight is needed of course). If you have more questions in general or specific ones please let me know! I’ve been looking for Aquaponics articles and this one is spot on. Many thanks for sharing your knowledge! Beware of HOW you spend you money to buy things like guns, OTC medications — and gardening supplies!!! Cops in the Midwest raided people’s homes based solely on their purchase of hydroponic gear. Switch to a cash-based lifestyle, and NEVER provide retailers with your REAL name, or your REAL address, or your REAL phone number, or your REAL zip code, etc. We should all learn to become 100% anonymous CASH buyers. If a retailer insists on “information gathering,” then we should shop elsewhere. While I LOVE online shopping, this is an even WORSE practice!! Your entire transaction history is recorded and archived, and this also includes your mailing address and such. We will accept cash too if you want to pick up the system yourself or are available for local delivery. Right now we are only in Phoenix, Arizona but we will have more locations soon. Contact us on our website if the Jack’s warning is of a concern to you and you need to make other arrangements besides an online transaction. Thanks! In addition to accepting Credit Cards and CASH, We Will Also Accept GOLD, SILVER, and Bitcoins! If you are paying with Gold or Silver, you can ship it to us and then we will ship out a system kit. Or if you prefer to make a payment by any of the above means in person and then either pick up your system or make delivery arrangements at that time, we can do that also. We are flexible; just contact us to work out the details! We haven’t gotten around to it yet, but I haven’t been shy about sharing the idea with my friends online, so check Craigslist in your city to see if anyone else is advertising such a garage sale. We will accept cash too if you want to pick up the system yourself or are available for local delivery. Right now we are only in Phoenix, Arizona but we will have more locations soon. Contact us on our website if the Jack’s warning is of a concern to you and you need to make other payment arrangements besides an online transaction. Thanks!